Our goal in this section is to provide numerous items for you to choose from and browse through a vast variety of porcelain choices from around the world. Shown porcelain pieces vary from dining sets, single items for daily use, collection, or display worthy incorporation into any room style. From antique pieces dating to 1800 Spode, Homer Laughlin, Capodimonte, Haviland Limoges, Johnson Brothers, Noritake, Rosenthal, Bavarian in North and South American to modern European, Asian, African made porcelain. Plates, cups, bowls, salt shakers, bonbons, vases, paperweights, bookends, cookie jars, porcelain figurines of all shapes and colors and all other porcelain items. If you need that centerpiece able to strike a conversation at you hostess' parties you had come to the right area. 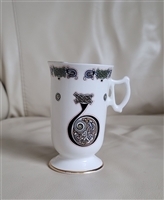 You will find in this section quality antique, vintage and modern porcelain worthy of acquiring as a gift for any occasion. Crooksville Hyde Park, no border, teacup and saucer. 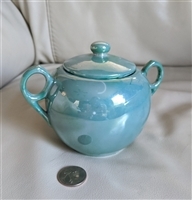 Turquoise lusterware sugar bowl from Japan. Old Leeds Spray dinner plate by Royal Doulton, 1930s. Circa mini bowls made in Germany, Luminescent with Rose decor. Set of 2. Calico plates in white porcelain and small blue flowers, set of two. TAKITO lustre sparrow and flowers plates. Cream embossed porcelain colorful teacup and saucer. UCAGCo made in Japan tea cup and saucer, floral. Large porcelain pigs salt and pepper shakers, Calif USA. Royal Tara Book of Kells tall cup from Galway, Ireland. Royal Tara, Book of Kells design tall cup from Galway, Ireland. 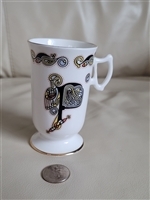 Royal Tara, Book of Kells design elegant cup from Galway, Ireland. Vintage porcelain and clay animals, set of 6. 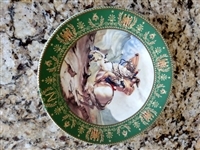 D'Arceau Limoges Bonaparte porcelain plate, AV 698. Equestrian style small plates from Japan, set of two. Minton porcelain, Haddon Hall bread and butter plate. Josef Original 16th Birthday porcelain girl. Antique Moritz Zdekauer M Z porcelain hair receiver. TAXCO by Spring China porcelain bread and butter plate. Set of 3. Rosina China teacup and saucer, England. Vernon's 1860s lugged chowder set of two. Royal Chelsea tea cup and saucer sign H. Fennell. TAXCO by Spring China porcelain salad plate. Set of 4. Bassano Italy large leaf plate with birds.